Former finance minister Ignatius Chombo and former Zanu PF national youth secretary, Kudzai Chipanga (file photo). 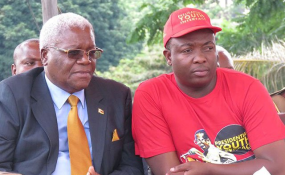 Former Finance minister Ignatius Chombo and Zanu PF national youth secretary, Kudzai Chipanga will on Tuesday approach the High Court for bail. This comes after both were refused bail by Harare magistrates on Monday. Briefing the media after the bail ruling, defence lawyer Lovemore Madhuku said; "It is clear that the ruling both magistrates' delivered was planned. "They both didn't consider our submissions. The state said the accused would abscond, we said they will surrender their passports, title deeds and stay at their homes but they didn't look at that. "Tomorrow (Tuesday) we will appeal against both rulings at the High Court and we expect our cases to be heard within 48 hours as stipulated by the constitution." Chombo appeared before magistrate Elisha Singano who Chombo's life would be at risk if he was released on bail. Meanwhile, Chipanga appeared before magistrate Josephine Sande who also denied him bail for same reasons. The two former Zanu PF officials were picked after the military embarked on an operation to allegedly root out criminals around former President Robert Mugabe two weeks ago. Chipanga is accused of publishing false statements denigrating defence forces commander General Constantino Chiwenga. For his part, Chombo faces fraud and corruption charges over offences allegedly committed between 1997 and 2005. The two were remanded in custody to December 8.